With two motion-controlled Zelda games now under his belt, Eiji Aonuma believes that buttons would be a step backward. While most Zelda fans played Twilight Princess on the Wii, motion controls weren't a requirement. The game was even released on the GameCube, giving standard-controller stalwarts the option to play things old school. 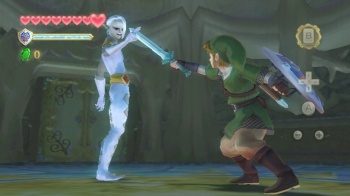 More recently, however, Skyward Sword, actually forced players to move if they wanted Link's sword to do the same. The game even required Wii MotionPlus, shelving any hope gamers had of lazy play. If you're someone hoping that this was just a fad, think again. According to series producer Eiji Aonuma, Skyward Sword's motion control scheme will likely become the new standard for the series moving forward. "I honestly think we cannot go back to button controls now," Aonuma said during an interview with Official Nintendo Magazine, "so I think that these controls will be used in future Zelda titles, too." Earlier this year at E3, Nintendo showed some of how it hopes to utilize new control schemes to continue evolving player experience. The demonstration included showcasing the Wii U's tablet as an inventory management screen for a hypothetical Zelda title. Considering Aonuma's recent comments, it may not be a bold conclusion to assume that in the future, the Wii MotionPlus and the tablet controller might be used in conjunction to help players save Hyrule from whatever various magical tomfoolery is overtaking it. Regardless, we'll be seeing the final Wii U design at E3 2012, and possibly hearing more news for what's in store for the series alongside of it.